Shows your support for the fight against breast cancer. 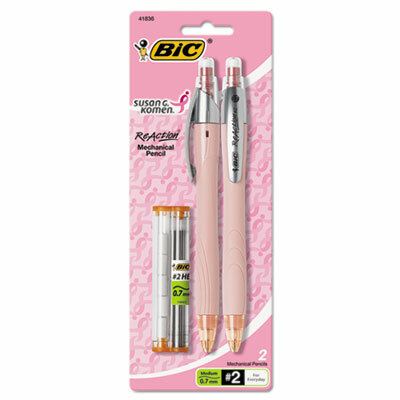 Refillable mechanical pencils feature shock-absorbing technology to prevent lead breakage. Full length rubber grip provides writing comfort. Strong lead generates bold, smooth marks. Click here to see more Pencils! Total Recycled Content Percent: 0% Pink Comments: In 2014-2015, BIC® USA will contribute $50,000 to Susan G. Komen® in support of its promise to end breast cancer forever. Consumer action will not result in an additional donation to Komen. www.komen.org.